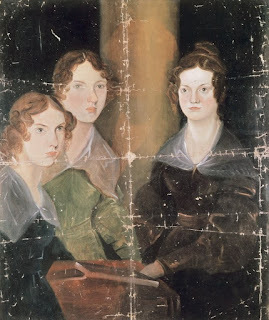 Anne Bronte (1820-1849), Emily Bronte (Thornton, 1818 - Haworth, 1848) and Charlotte Bronte (Thornton, 1816 - Haworth, 1855), English writers, Oil on canvas by Patrick Branwell Bronte (1817-1848), ca 1834. Photograph. Encyclopædia Britannica ImageQuest. Web. 19 Dec 2015. "I am miserable when I allow myself to dwell on the necessity of spending my life as a governess." Jean Paul-Sarte is known for his declaration: "Hell is other people." Charlotte Bronte would have gone further and said, "Hell is other people's children." Anne Bronte, the youngest of her literary family, persevered as a governess far longer than Charlotte did. Her novel Agnes Grey, published in 1847 chronicles the fictitious trials of a mild-mannered governess. Anne's novel was overshadowed by her elder sister Charlotte's dramatic, Gothic novel Jane Eyre, but Anne's novel paints a realistic portrait of the drudgery, disrespect, and powerlessness of being a governess in Victorian times. According to Kathryn Hughes author of The Victorian Governess, 25,000 women earned their living as governesses, during a period of English economic instability owing to the Napoleonic wars. Middle class families coped with the financial meltdown by having their daughters work as governesses. As daughters of a poor clergyman, the Bronte sisters sought out work as governesses and also dreamed of opening their own school at the Haworth parsonage. The life of a governess was friendless and isolated. Governesses taught and raised children, but were not a member of the family and also a source of resentment among the servants who couldn't absorb governesses into their own domestic pecking order. Governesses could move on through suitable marriages, but families were so afraid of having their sons wanting to marry the governess, that they were urged to only hire the plainest possible governesses. Governesses were only needed for a few years to care for and instruct her employer's children, so these women were constantly having to look for a new job. Salaries were so low, there was nothing left to save for health care or retirement, especially if governesses were working to support their own families back at home. The specter of poverty always loomed, so in 1841 the Governesses' Benevolent Institution was created to help them with pensions. In addition to the lack of a living wage, governesses were in the bind of being unable to discipline their charges and being undermined by the parents they worked for. In a letter Charlotte sent to a mutual friend, she wrote, "Anne is not to return - Mrs. Ingham is a placid, mild woman - but as for the children it was one struggle of life-wearing exertion to keep them in anything like decent order." Agnes, the daughter of a destitute clergyman, desires to prove herself and help her family earn money, as a governess. Her first job is at Wellwood house to work for the Bloomfield family. Mrs. Bloomfield spoils her children while Mr. Bloomfield openly disapproves of Agnes's work. The children are out of control and Agnes is blamed for their antics. Tom, the oldest Bloomfield child, enjoys torturing small animals, especially birds. Children in the Victorian era were considered to be wild animals to be brought to heel. Agnes Grey is a shocking novel that makes corporal punishment look like a reasonable option, because the children Agnes governs are sadistic, soulless, little monsters. In less than a year, Agnes is fired, since Mrs. Bloomfield thinks that her precious children aren't making the academic progress she expects. Agnes refuses to give up and finds a position with the wealthy Murray family. The two boys, John and Charles, are both sent to school, but Agnes is left with the girls Rosalie and Matilda. Mathilda is a foul-mouthed, compulsive liar and tomboy. Rosalie is a vapid, two-faced flirt. Both girls enjoy bullying Agnes and using her as a social prop. Agnes begins to visit Nancy Brown, an old woman with poor eyesight who needs help reading the Bible; there Agnes meets the new parson, Mr. Edward Weston. The novel begins to take an uplifting spiritual and romantic turn. Agnes is surprised during a walk by Mr. Weston, who picks some wild violets for her, which she saves in her Bible. Their friendship is noticed by Rosalie Murray, who has entered into society and enjoys torturing her own suitors through malicious flirtation. Mr. Weston becomes Rosalie's latest target, which causes Agnes great internal anguish, although Rosalie marries and becomes Lady Ashby. As a proper Victorian governess, Agnes is unable to profess her love for Mr. Weston openly, but takes comfort in the Sunday services he presides over. Agnes receives a note from her married sister Mary, that their father is dying and begs Agnes to come home. Agnes arrives too late to see her father alive. After his funeral, Agnes opens a small school with her mother, leaving behind the Murrays and Mr. Weston. teach us how to die, but how to live; and the earlier you become wise and good, the more of happiness you secure. And now, Lady Ashby, I have one more piece of advice to offer you, which is that you will not make an enemy of your mother-in-law. Don't get into the way of holding her at arm's length, and regarding her with jealous distrust. I never saw her, but I have heard good as well as evil respecting her, and I imagine that, though cold and haughty in her general demeanour, and even exacting in her requirements, she has strong affections for those who can reach them; and, though so blindly attached to her son, she is not without good principles, or incapable of hearing reason; and if you would but conciliate her a little, and adopt a friendly, open manner–and even confide your grievances to her ... real grievances, such as you have a right to complain of ... it is my firm belief that she would, in time, become your faithful friend, and a comfort and support to you, instead of the incubus you describe her." Agnes leaves Ashby Park and gratefully returns home to her mother and their humble school. The day after she arrives, she goes for a walk on the sea shore and encounters Mr. Weston, who had been looking for her since he moved to the nearby parsonage. A respectful courtship ensures and they marry and have three children together, a much happier ending than Anne Bronte enjoyed in her own short life. Of all of the Bronte sisters, Anne showed the most resilience in seeking and maintaining employment outside of the family circle. Anne first worked for the Ingham family at Blake Hall, in Mirfield, which is located in West Yorkshire. The children she taught were consistently disobedient and enjoyed tormenting her, knowing that their parents would do nothing to stop them and insist on treating their governess with any respect or cooperation. Anne's second job as a governess was to the children of the Reverend Edmund Robinson and his wife Lydia, at Thorp Green Hall, located in York, and she worked for them from 1840 to 1845. The house appeared as Horton Lodge in her novel Agnes Grey. Anne had four pupils: Lydia, aged 15, Elizabeth, aged 13, Mary, aged 12, and Edmund, aged 8. This time Anne succeed in her job and was treated well by her employers. The Robinson daughters became her lifelong friends. Anne accompanied the family to the vacations to the coastal town of Scarborough, where she ultimately chose to die during her final illness due to tuberculosis. Anne made the mistake of getting a job for her unstable brother Branwell, who worked as a tutor for the Robinsons' son, Edmund. Branwell returned the favor by instigating a disastrous affair with the lady of the house, Lydia Robinson. Anne had resigned and returned to Haworth with a clean nose, before Branwell was fired for his shameless misconduct. Agnes Grey is a bold novel in terms of accentuating class tensions and snobbery with employers aimed at Agnes and Agnes herself judging her employers and the children under her care even more harshly. Women were barred from most professions and being a governess was considered the most respectable and realistic option to pursue. The Bronte sisters can be forgiven for their frustrations and superiority complexes. The misery of being a governess was so pronounced with the Bronte sisters, that they couldn't persevere in this profession, and fortunately for the world, they turned to writing and turned their struggles into outstanding literature, although their employers probably never thought they would generate such shocking material.